Often multi-function printers are usually gussied scaled-up personal printers, but here is where Xerox’s 50-year origin in business copiers pays off and leaves the other manufacturers behind. 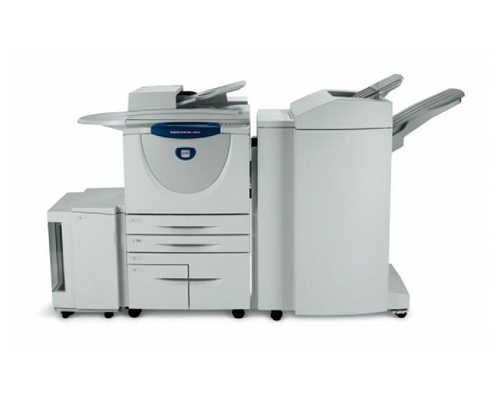 For heavy business needs, the free-standing Xerox WorkCentre 7665 is the mid-range of the 7600 series. It not only offers copy, scan, and facsimile features, but color printing that is faster and sharper than any Phaser 7000 model. Out the box the 7665 has a 3,260 sheet paper capacity, with the ability to upgrade to 5,260 sheets. Add the choice of several finishers and high-speed paper feeders, and the WorkCentre 7665 becomes an all-in-one publishing house. The first thing that grabs your attention on the WorkCentre 7665 is the prominently positioned blue control panel. The touchscreen User Interface (UI) gives easy access to popular functions, with additional menus for all of the WorkCentre’s features. A traditional 10-key fax pad is provided along with the buttons most users are used to using with copiers. One of the nice features of this multifunction is it can multitask. A person can scan or copy directly on the WorkCentre while faxing and printing is being done via the network and phone lines. The WorkCentre 7665 prints at speeds up to a blistering 25 two-sided pages per minute in color (and 50 ppm single-side prints), 65 single-sided pages per minute in black-and-white. Having one of the highest resolutions at 2,400 x 2,400, it gives you professional high-image quality and clarity. The polymerized toner helps enhances definition and sharpness, while giving photo-like glossiness to regular paper. The duplexing Automatic Document Feeder (ADF) holds can handle the copying, scanning, and faxing of your 2-sided originals, be they in colour or in B&W. 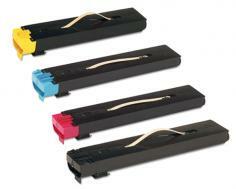 With a 250-sheet capacity, it handles about twice the amount of other multi-funcitions with ADFs. The 7665 comes with two 500-sheet cassette trays and a 1,140-sheet tandem tray that supports papers from 8.5“ x 11” up to 11” x 17”. A 250-sheet multi-purpose bypass tray handles various paper weights and sizes up to 13” x 19”. The base-model 7665 comes standard with Ethernet. 1GB of memory and an 80GB hard drive enables this WorkCentre to handle any size print request and to securely save jobs to the hard drive. USB is optional. Three optional Finishers can give the 7665 full publishing features including staple, multi-hole punch, Z, C, and V-folding and binding for catalogs and magazines. The fax portion of the 7665 has transmission speeds up to 33.5Kbs for a 4-second/page transmission rate. A maximum resolution of 600 x 600 dpi allows for images in sharp detail. Using the automatic document feeder, up to 250 pages can be scanned on both sides.To save on paper the 7665 comes with junk fax filtering, and incoming multi-page faxes can be printed on double-sided paper. For sensitive information, incoming faxes can be securely saved directly to memory, only being printed with the proper password. 32MB of memory is reserved for the 7665 to hold up to 200 password-protected mailboxes. Network options are available to allow for faxing from your computer station. Color copies up to 13” x 19” can be made directly on the glass platen, or using the Automatic Document Feeder (ADF). The duplexing ability of the ADF allows for making copies from 2-sided originals without having to manually flip the papers. Zoom scales from 25% to 400% with a choice of 1% increments, automatic resizing, or in ten jumps. Up to 9,999 copies can be reproduced. Resolution and print speeds are spec’d at 2,400 x 2,400 dpi up to 65 ppm. You can choose if copies are to be collated or stacked into the offset catch tray. Scanned documents can be exported as 600 x 600 PDF files and sent to a network directory, e-mail, or on the internal 80GB hard drive. The 7665 is able to interface with 3rd party peripherals such as magnetic strip readers (for ID cards) and coin machines, to expand its functions beyond the workplace to universities and self-serve copy stores. For the people whose job is data security, the WorkCentre provides server-like functions and monitoring. The WorkCentre allows the network administrator to create password-protected accounts to prevent unauthorized use, the ability to regulate quotas by user or group policies, and the tracking and auditing of all services. The WorkCentre allows filtering of unauthorized IPs and ports, encryption of data in the 80GB hard drive, LDAP server security, IPv6 support, and block viewing of document names. Deletion of any stored images using U.S. DoD erasure algorithms can be scheduled during off-hours. Understanding the printing needs of today’s businesses in providing support for the major software applications, Xerox has included HP PCL5c, PCL6, and Adobe PostScript3 print emulators to satisfy the most office demands. The 7665 also offers Adobe’s “PDF-Direct” print which enables PDF files to be sent directly to the WorkCentre for printing without opening an Acrobat application. For professional color matching in publication work, the WorkCentre 7665 can be set for Apple ColorSync, CIE, PANTONE, and Adobe PostScript color standards. In spite of Xerox’s claims, you don’t want to just plop anybody in front of this unit without some training. As a support engineer, I found the most downtime for machines of this size comes when untrained people start “using” them. Since most buyers of WorkCentres will want to establish passwords and user accounts for auditing and security, the end-user will need to be taught the basics (like what their password is). With a 1-hour training and “lab”, I‘ve been able to get the most technophobic people productive on these office machines. Here’s where an hour of prevention is worth days of non-productivity. Normally multifunction printers have identical resolutions for scan and copy functions, often with the scanning resolutions being higher. While it’s not a big issue, it is interesting that the WorkCentre 7665 is only spec’d to have a 600 x 600 dpi resolution in scan mode. Review it: "Xerox WorkCentre 7665 "
The WorkCentre 7665 uses Xerox’s Emulsion Aggregate toner, a resin-like ink for sharper imaging and less color bleeding. Prints that use polymerized toners like EA tend to have a nice glossy look and a waxy feel to them. 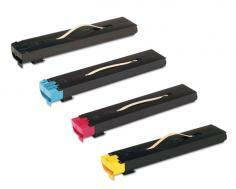 Dual black cartridges allow for easy changing of the highest consumed item without stopping the printer. The each black toner provides 5% coverage on 30,000 pages, and the three colors 34,000 pages. Just remember that if you’re doing full-color spread layouts and photograph prints, the actual toner usage per page is going to be at least 10 times more, reducing the number of pages you can get out of a cartridge. Other consumables to consider are replacement of the imaging units (drums), the fuser and transfer roller, and the waste toner bottle.